HALFWAY are playing at this..
There’s only one Pope. There’s only one Dalai Llama. And there’s only one Boss! This is the level of esteem, reverence even, with which legendary singer-songwriter Bruce Springsteen is held amongst his millions of fans around the globe. 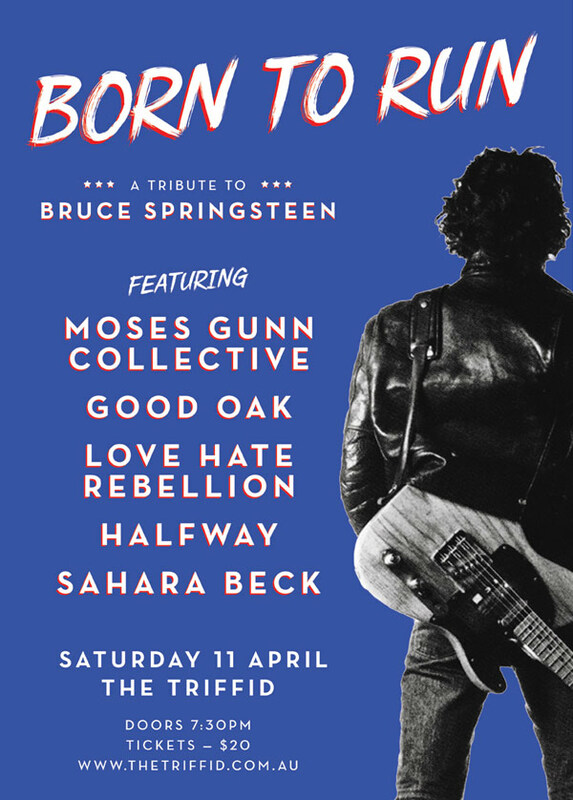 The Triffid presents ‘Born To Run’, a celebration of The Boss featuring a bunch of Brisbane’s finest bands on Saturday 11 April. From his debut release ‘Greetings from Asbury Park, N.J.’ to his most recent offering ‘High Hopes’ Springsteen has to date released 18 albums, the track listings of which read like a soundtrack for the past 4 decades. Always a champion of the working people and a master of channeling the zeitgeist of any given time, Springsteen has written some of the most potent and poignant songs of his era. Set lists including tracks like Born to Run, Glory Days, Rosalita, Badlands, The River, Nebraska, Dancing In The Dark, Hungry Heart and Streets of Philadelphia (the list goes on and on) continue to sell out stadiums around the world. He was inducted into the Rock and Roll Hall of Fame in 1999 and has won 20 Grammy Awards, 2 Golden Globes and an Academy Award, Emmy Awards and so much more. So, it’s time. Pull out your denim! The Triffid honors The Boss with an ensemble of earnest Brisbane musicians.